– Green Bay kicks off its 95th season in team history, and 93rd as a member of the National Football League, by visiting San Francisco in Week 1 for the first time in franchise history. – It marks the second consecutive year that the Packers have opened their season against the 49ers (at Lambeau Field in 2012), the first time Green Bay has faced the same opponent in Week 1 in consecutive seasons since it squared off with the Chicago Bears in three straight season openers from 1979-81. – Outside of the last two seasons, the only other time the Packers and 49ers played each other in Week 1 came in 1976 at Green Bay. – Today’s matchup will feature two of the three teams in the NFL to have won 24 or more regular-season games over the past two years. Since 2011, Green Bay has a 26-6 mark (.813) in the regular season, No. 1 in the league over that span. San Francisco is 24-7-1 (.765) since ’11, No. 3 in the NFL behind only the Packers and New England (25-7, .781). – According to the Elias Sports Bureau, this will be the first Week 1 matchup since 1991 featuring two teams that have won 24-plus games over the previous two regular seasons. On Sept. 2, 1991, San Francisco (28 wins from 1989-90) visited the N.Y. Giants (25 wins from 1989-90) in Week 1 on Monday Night Football. – This will be the third matchup between the two clubs in the last 12 months, with the teams meeting last year on Sept. 9 in Green Bay and also in a NFC Divisional playoff contest on Jan. 12, 2013, in San Francisco. – Green Bay enters today’s contest having won nine of the last 10 regular-season meetings against the 49ers. Including the playoffs, the Packers have won 13 of the last 16 against San Francisco. – Under Head Coach Mike McCarthy, the Packers have won five of their last six season openers, which is tied for the No. 2 mark in the NFL with Baltimore over that span behind only New England (6-0 since 2007). – That included five straight Week 1 wins from 2007-11, which made McCarthy the only head coach in franchise history to accomplish that feat. – Green Bay has 52 wins on Kickoff Weekend, second most in NFL history behind only the Chicago Bears (53 victories in Week 1). – This will mark just the second time in McCarthy’s eight seasons (2006-13) that the Packers have opened their season away from Lambeau Field. The only other instance over that span was in 2010 at Philadelphia. – Opening on the road has been a rare occurrence dating back even further. Since the 1970 AFL-NFL merger, the Packers have opened their season at home 32 times while opening on the road just 12 times. Since 1986, 23 of Green Bay’s season openers have been at home, making today’s game just the fifth time in the past 28 years that the Packers have gone on the road to start their season. – Although this will only be the second time under McCarthy (2010 at Philadelphia) that the Packers have played away from Lambeau Field in Week 1, they have had success in their first road contest of the season. – Green Bay has won its first road game in six of seven seasons under McCarthy, with last season at Seattle in Week 3 the lone exception. – The Packers have an all-time record of 53-37-2 (.596) in road openers, the most wins and third-best winning percentage in the NFL. – With a six-game winning streak in the first road game of the season from 2006-11, McCarthy joined Vince Lombardi (eight straight, 1960-67) as the only coaches in team history to win six or more consecutive road openers. – Over the past four seasons (2009-12), Green Bay posted a 9-4 record (.692) in the month of September, which was tied for No. 2 in the league over that span behind only Baltimore (10-3, .769). – The Packers are 11-5 (.688) on the road over the past two seasons, which is tied for No. 2 in the NFL behind only New England (12-4, .750). – Green Bay turned the ball over seven times on the road last season, tied for the fewest giveaways in the league away from home in 2012. – Including their two playoff games in 2012, the Packers have scored TDs on 17 of their last 20 trips (85.0 percent) inside the red zone. – QB Aaron Rodgers has not thrown an interception in 144 consecutive passing attempts in the regular season, the longest current streak in the NFL. His career-long streak is 181 passes without an INT in 2010. Rodgers has not had a two-INT game in 39 straight regular-season starts, the longest streak in NFL history since the 1970 AFL-NFL merger. – In three career regular-season starts against the 49ers, Rodgers has completed 83 of 119 passes (69.7 percent) for 945 yards and seven TDs with one interception for a 109.4 passer rating. He has also rushed for 79 yards on 16 carries (4.9 avg.) in those three contests. – Over the last two seasons, Rodgers has completed 369 of 550 passes (67.1 percent) for 43 TDs and five INTs for a 116.2 passer rating on the road. That passer rating is the best by a QB in NFL history on the road over a two-season span (min. 300 attempts). – WR Randall Cobb is the only player in NFL history to score on a kick return (kickoff or punt) in Week 1 of each of his first two seasons in the league. Cobb scored on a 108-yard kickoff return vs. New Orleans in the 2011 opener and on a 75-yard punt return vs. San Francisco in Week 1 of 2012. – TE Jermichael Finley needs five catches to move past No. 3 Ed West (202) on the all-time franchise list for tight ends and 110 receiving yards to move past No. 2 Ron Kramer (2,594). In his last three regular-season games, Finley has caught 18 passes for 203 yards (11.3 avg.). – In two games against San Francisco last season, LB Clay Matthews registered 3.5 sacks. – WR James Jones has caught 18 passes for 222 yards (12.3 avg.) and five TDs in his last three regular-season games. He has caught at least one TD pass in three consecutive regular-season contests, which matches his career high. – In two games against the 49ers last season, P Tim Masthay posted a 47.7-yard average and a 43.7-yard net average on 10 punts, with six of those punts placed inside the 20-yard line. – With a start today, T David Bakhtiari would become just the fourth Green Bay rookie to start at left tackle in a season opener since the 1970 AFL-NFL merger (Bill Bain, 1975; Mark Koncar, 1976; Ken Ruettgers, 1985). – With a start this afternoon, RB Eddie Lacy would become just the third Green Bay rookie to start a season opener at running back since the merger (John Brockington, 1971; Brandon Jackson, 2007). 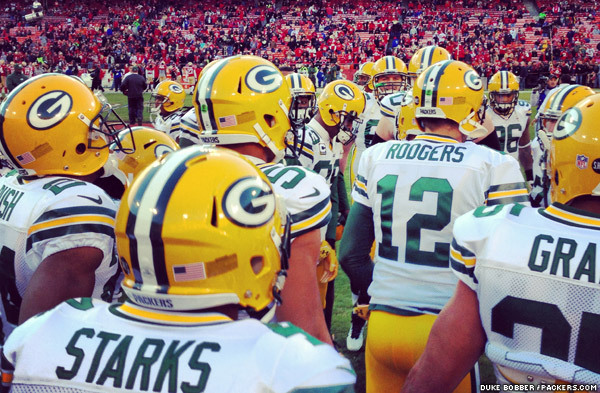 – Today’s captains will be QB Aaron Rodgers (offense), DT B.J. Raji (defense) and P Tim Masthay (special teams). Today’s officiating crew includes referee Bill Leavy (127), umpire Ruben Fowler (71), head linesman John McGrath (5), line judge Mark Perlman (9), field judge Jimmy Buchanan (86), side judge Keith Parham (87) and back judge Keith Ferguson (61). 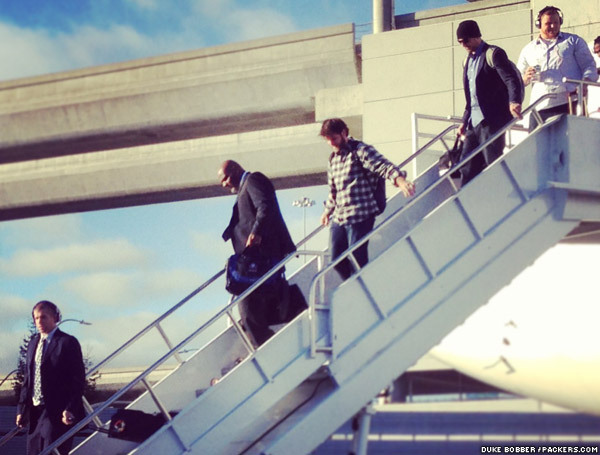 The Green Bay Packers landed at San Francisco International Airport Saturday afternoon. The team continues to prepare for its regular season opener vs. the 49ers on Sunday. 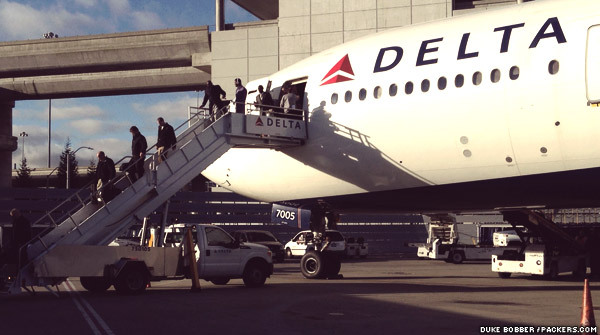 The Packers board buses after landing in San Francisco. San Francisco 49ers head coach Jim Harbaugh and QB Colin Kaepernick were made available to the media via conference call Wednesday. To listen to Harbaugh and Kaepernick talk about Sunday’s season opener in San Francisco, click on the links below. The Green Bay Packers fell to the San Francisco 49ers 45-31 in the Divisional round of the playoffs at Candlestick Park. Green Bay Packers defensive back Charles Woodson met with reporters following the team’s 45-31 Divisional Round Playoff loss to the San Francisco 49ers. Green Bay Packers wide receiver Donald Driver met with reporters following the team’s 45-31 Divisional Round Playoff loss to the San Francisco 49ers. Green Bay Packers wide receiver Greg Jennings met with reporters following the team’s 45-31 Divisional Round Playoff loss to the San Francisco 49ers. Hear from Green Bay Packers cornerback Casey Hayward, defensive tackle B.J. Raji, linebacker A.J. Hawk, and guard/tackle T.J. Lang following the team’s 45-31 Divisional Round Playoff loss to the San Francisco 49ers. Look through the lens of team photographer Jim Biever. 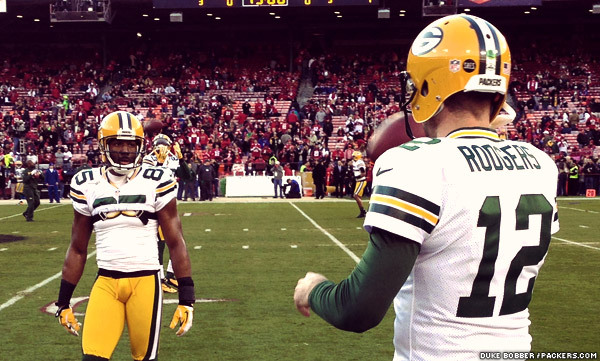 Check out photos from Saturday’s Packers-49ers Divisional Playoff game at Candlestick Park. Read what the Packers and 49ers were saying after Saturday night’s game. Time of possession was obviously a problem, do you agree? What does it feel like to lose a game like this? How would you assess your performance on offense? On the deep ball to WR Jordy Nelson, on the post, what did you see on that play? 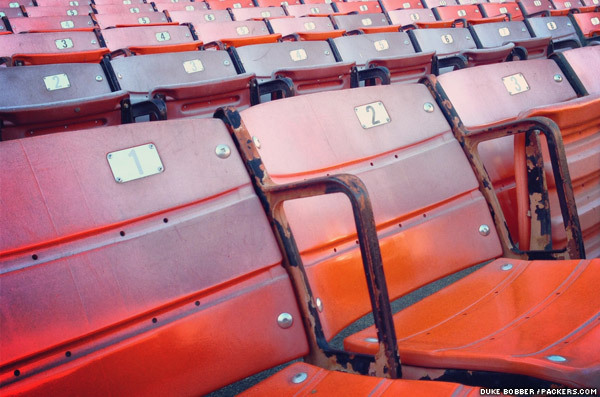 I don’t know if you talked about this, but this is your first game as a player at Candlestick? Second, there was excitement because of the fact that you are coming back home and all that? How did you feel at half time? Did you think this was a team that was going to win it all? What was your impression of the QB Colin Kaepernick? How are you feeling when it was 31-24 and getting the ball, and feeling like this is going to be a track meet back and forth between the teams? How did they game plan you? Were you hurt by an over-aggressive defense? You’ve had a really impressive rookie year. Now that’s it’s come to a finish, how do you feel about your season? Was it a question of you guys were there, but [QB Colin] Kaepernick made good plays despite good defense? Or was there anything scheme-wise? Did this game play a little too close to home like the way the first game played out? The time of possession did not work in your favor the first half. In the second half was it just hard to get anything sustained? This must sting because you guys know how good you are. Do you think about your future now that this game is over? “It has been great. I love this organization. The reality is that there will probably be some changes made. Hopefully I stay here. If not I am ready to move wherever. It is what it is, I am not naïve to that. I am being a realist. I love this organization I wouldn’t want to go anywhere else. If I have to that is what I have to do. What made it so hard to contain Colin Kaepernick today? How tough is a loss like this to swallow? This is the second year in a row that there has been a disappointment like this, how tough is it the second time around? Third down was huge for the 49ers. What was it that they were doing that kept them on the field? Why is Colin Kaepernick so difficult to defend? What happened on the muffed punt? Did you have any thought, just forget about what was coming and just make the fair catch? What’d you think about that performance from your team? What did you say to Colin after that pass was intercepted and returned for a touchdown to get him back going again? Why is that such a rare quality do you think? Did the game plan involve getting Kaepernick running? It seemed like that was a huge part of this one. Did you plan for that? Did you set that up by not doing that very much in the last few regular season games? There didn’t seem to be a lot of read option against Seattle against Arizona? Can you describe how DT Justin Smith returned today and how he looked? How well did WR Michael Crabtree play, and how vital is he to the offense? You’ve mentioned that Colin doesn’t even say that much to you when you talk to him. Did he just give you a look in the eye after the interception? Did he say anything to you like, like “hey I got this?” Was there any conversation from him to you? Were you able to see from the sidelines, they showed some replays, it looked like T Joe Staley was doing a pretty good job against LB Clay Matthews when he was lined up on that side? Were you able to notice any of that? There was a perception that if you had lost tonight with Colin that your decision to make him the starter would have been a mistake. Were you even thinking, or do you care about that perception? How did you used to respond after an interception when you were quarterback? Going forward for next week what do you want to see in improvement on the defensive side of the ball? You said you have to go work on some things. What do you want to see for next week? At what point tonight did you realize your brother had won his game? Someone told you from upstairs? When you say it was in the game plan for Colin to run, is it just in the read option you’re just telling him think more about running that, than giving it to the running back? Is that the game plan when you want him to run the ball? Your first playoff start and it was just like how I remembered covering you at Nevada. You were flowing out there, can you talk a little bit about that? But how about you, you seemed to be just feeling it? What about your feeling after the interception? Were you aware that you broke the NFL record for most rushing yards as a quarterback in any game? What is it like standing there and listening to your teammates describe you in the way they did? Have you ever rushed for that many yards in a game at any level? Can you describe how the 56-yard touchdown came about and what you saw? How well did Michael Crabtree play in particular? Earlier in the season you talked about how you wouldn’t know until the game if you were in or not. Can you talk about the ride this season? We love to categorize players, he’s a runner, he’s a passer… are you hard to categorize? Coach Harbaugh mentioned that your running was part of the game plan this week. Did you know that a lot of the responsibility was going to be on your legs? Are both of those running touchdowns designed runs? What happened there on the first run? Were they spying on you at all out there? How much were they double teaming Crabtree? What was your best pass? Last week Joe Webb of the Vikings had a lot of success running until the game got out of hand. Did you see anything from that game that gave you opportunities against them? Your touchdown catches came at a time when you guys really needed to score. What was the first half scoring frenzy like? You said that you built off your post season last year, how did it feel to start on a win like this? How about Kaepernick’s performance tonight? Why do you think you two play so well together? Did Green Bay try to do anything different with you this time and as time went on? When Colin is running, do you see the defense have to react so much to him and maybe open up some other plays? What was the feeling in here at halftime? When Colin throws an interception to start the game, how did you see him react? Last year you said you wanted more opportunities, did you feel like you had something to prove in this game? When you stretch things out, it’s kind of hard to zero in on the receivers and watch [QB Colin Kaepernick]. When you’re blocking, can you tell what’s going on, can you tell if Kaepernick is going to run, is he’s going to throw, escape? Can you tell from the crowd reaction? “The one thing, I’ve said this from day one about Colin, since he started playing, he’s always been confident. When you see a guy that’s playing quarterback in this league that young and he’s that confident, hats off to him. Is it an adjustment for you running the read option? What was it like for you out there with all that room for running? What is it like having your quarterback outrushing you? The offense had 44 points and you had a nice night. How does it feel about beating QB Aaron Rodgers today? What kind of statement is it to get back to the NFC Championship? How important was it for you to play? What was he (QB Colin Kaepernick) like in the huddle when he was running so well, and operating the offense so well, in the read option? A few times replays isolated you working against LB Clay Matthews, and it looked like you did a good job with him. Do you feel like you did? Can you guess what percentage of the time he was lined up across from you? What was the moment when you saw them when you realized this was too tough for them to win? The game starts on such a weird note, the crowd’s jacked up, you guys are excited. And there’s a pick six that goes the other way. What was your reaction when that happened, and how did you guys turn it around from there? From a defender’s point of view, how difficult is it to play against a quarterback like QB Colin Kaepernick? Can you talk about how impressed it is to see him through his development? So much is talked about with guys like Redskins QB Robert Griffin III and Colts QB Andrew Luck. But, those guys are out and Colin’s still in it helping you guys out? You talk about how fast he picks things up, how fast is he though when you see him on the field? Can you talk about the overall defensive performance and what would you like to see improve as you go into the next game? SAN FRANCISCO–The Packers’ season ended in Candlestick Park on Saturday night, in a 45-31 loss to the 49ers in the divisional round of the NFC playoffs. In a game that gave birth to a new star in the NFL, the Packers surrendered a playoff-record 183 yards rushing to second-year quarterback Colin Kaepernick, who was making his first postseason start. Kaepernick rushed for two touchdowns and passed for 263 yards and two touchdowns, all of that after having thrown an interception that was returned by Sam Shields for a touchdown on the 49ers’ first possession of the game. The major problem Aaron Rodgers and the Packers offense faced was a ridiculously lopsided time of possesssion disadvantage that left the Packers with little more to do but stand on the sideline and watch Kaepernick emerge as a postseason star. San Francisco running back Frank Gore rushed for 119 yards and a touchdown, and the season ended for the Packers much as it started in a loss to the 49ers in which the visitors dominated time of possession with a powerful rushing attack. Then, under starting quarterback Alex Smith, it was thunder. Kaepernick has added lightning to that rushing attack and the 49ers will play the winner of Sunday’s Seattle at Atlanta game in next weekend’s NFC title game. The 49ers blew the game open in the second half, pushing a 24-21 lead to 45-24 with 3:34 to play. Rodgers finished the game having completed 26 of 39 passes for 257 yards, two touchdowns and one interception. SAN FRANCISCO–The Packers trailed the 49ers, 24-21, at halftime of tonight’s NFC Divisional Round playoff game at Candlestick Park..
Packers cornerback Sam Shields gave the Packers a great start by intercepting a Colin Kaepernick pass and returning it 52 yards for a touchdown on just the first possession of the game. Kaepernick, in his first postseason start, fought off the mistake to move the 49ers 80 yards in eight plays and tie the game with a 20-yard touchdown run. Back stormed the Packers on their own 80-yard touchdown drive, which required seven plays and ended with running back DuJuan Harris scoring on an 18-yard run up the middle. The Packers made a mistake they might come to regret when Jeremy Ross fumbled a punt at his 10-yard line and the 49ers recovered at the 9. Three plays later, Kaepernick completed a 12-yard touchdown pass to wide receiver Michael Crabtree. Midway through the second quarter, a long pass by Aaron Rodgers for Jordy Nelson was intercepted by the 49ers’ Tarell Brown, who returned the ball 39 yards to the Packers 48. Kaepernick converted a key third-and-long play with a 15-yard run, and then followed that with a 20-yard pass over the middle to Crabtree for a touchdown and a 21-14 lead. Rodgers rallied the Packers down the field to tie the game. It was, yet, another 80-yard drive. This one needed six plays. Rodgers found wide receiver James Jones over the middle for a 20-yard scoring strike that tied the game at 21-21. Troubled kicker David Akers booted a 36-yard field goal on the final play of the first half, capping an 11-play, 62-yard drive. Kaepernick overcame his bad start to complete 11 of 23 passes for 148 yards and two touchdowns. Rodgers was held to five completions in 10 attempts for 96 yards and one touchdown. Kaepernick leads the 49ers with 107 yards rushing and Harris leads the Packers with 47. The 49ers have dominated time of possession, 21:47-8:13. Check out these behind-the-scenes photos from Saturday evening’s NFC Divisional playoff game between the Green Bay Packers and the San Francisco 49ers at Candlestick Park. The following players have been declared as inactive for tonight’s Green Bay Packers-San Francisco 49ers NFC Divisional playoff game at Candlestick Park. Packers WR Donald Driver is active.